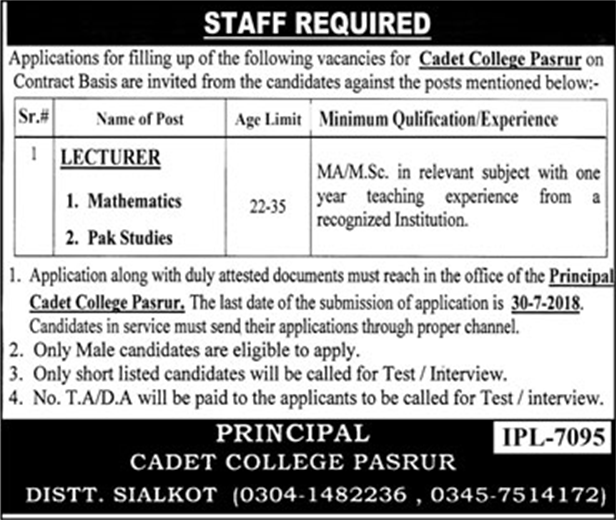 The Cadet College Pasrur Sialkot Punjab. MA/M.Sc. in relevant subject %ith one year teaching experience from a recognized Institution. 1. Application along with duly attested documents must reach in the office of the Principal Cadet College Pasrur. The last date of the submission of application is 30-7-2018. Candidates in service must send their applications through proper channel. 2. Only Male candidates are eligible to apply. 3. Only shortlisted candidates will be called for Test / Interview. 4. No. T.A/DA will be paid to the applicants to be called for Test/interview.